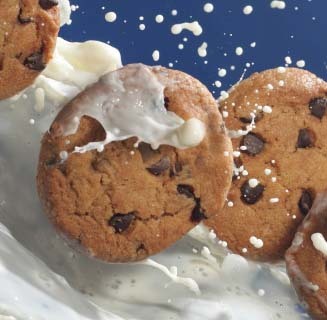 I played around with the concept of splashing milk on cookies using high-speed photography. We rigged the cookies are hot glued on a 3 feet stainless bar to position. Using regular studio flash for high speed photography does not work, unless you used specialised flashes like broncolor with short flash duration. Since we do not have those expensive equipment, we used Nikon flashes. We used two speedlites for this type of photography. When set to low power, speedlites give out short flash durations. So, we used two Nikon flashes, an 80DX to the right of the camera, around 45 degrees pointing to the cookies and diffused with white plexiglass. Another Nikon 800DX was place around 45 degrees behind the axis of the cookies to provide high lights on top to the cookies. No diffusion was used to this light. Both lights were set to manual, 1/64 power output. For the milk splash, I used a 12-in tube, 2-inch diameter, which is rigged on the right side sloping toward the cookies. Upon signal, my assistant would pour a glass of milk into the tube. We did not use photo cell signal. We just timed to press the shutter when it hits the cookies. Its a trial and error. We did around 5 splashes before the cookies get soft and crumble. So we change the cookies to new set and repeated the process again. This process is a real exercise of patience. Without patience, it will get you nowhere. At the end of the shoot, we ended up with a studio almost flooded with milk. But the satisfaction of being able to execute the concept is priceless. Not all companies are made equal, plus some are a lot more expensive compared to others.